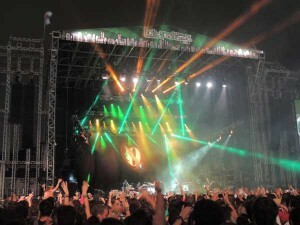 The 2013 Brazilian Lollapalooza Festival staged at São Paulo’s Jockey Club featured a selection of Robe moving lights on the main two stages, Cidade Jardim and Butantã. 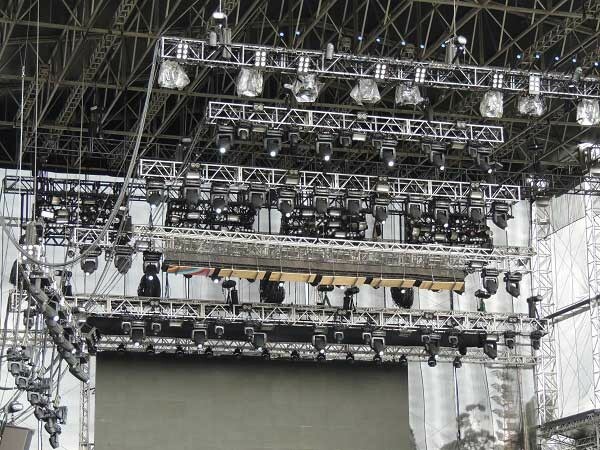 These were integral to the respective lighting rigs used to illuminate a truly stellar line up of international and local artists, enjoyed by around 60,000 people a day who flocked to see the action across the event’s four performance stages. The Butantã stage lighting rig included 27 Robe ColorSpot 2500E ATs and ten ROBIN 600 LEDWashes, while on the Cidade Jardim stage were 34 ColorSpot 2500E ATs, 19 ColorWash 2500E ATs and ten ROBIN 600 LEDWashes. Additional units were located above the side IMAG screens on both stages. The principal lighting contractor was São Paulo based LPL Professional Lighting. LPL director and LD Caio Bertti states: "We chose Robe moving lights because of the great support we receive from the brand itself and also from our rental market partners. I needed a large quantity of reliable fixtures and so chose to use our own Robe equipment together with additional units from Apple Produções with whom we work closely. It was a perfect arrangement … and all the Robes proved to be really robust." Artists rocking the Cidade Jardim and Butantã stages included The Temper Trap, The Flaming Lips, Deadmau5, The Killers, Franz Ferdinand, Queens of the Stone Age, Kaiser Chiefs, The Hives, Pearl Jam and many more.